I doubt there are many warehouses that do not have uses for flat pallets. So much is delivered on, despatched on and stored on flat pallets that pallets are in use everywhere. Most war ehouse managers will make do with timber pallets. Wood pallets are of course the most economical option and in so many cases have all the properties a storage site will need. These pallets can be designed to suit most storage needs, whether this might be a single trip light duty option or something heavier duty and more durable suitable for multiple used and for storage within pallet racking. The most common pallet size in the UK is 1200mm x 1000mm but with more and more products being shipped into and out of Europe, the Euro Pallet 1200mm x 800mm is becoming more common. However, no matter how well a timber pallet is treated, in time it is likely to split and splinter and require replacement. 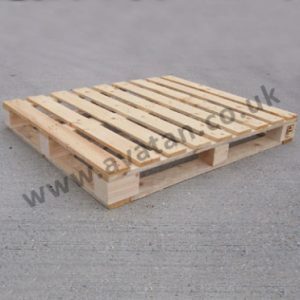 Avatan Handling Equipment offer a wide selection of timber pallets designed to suit most needs. Are timber pallets the only option? Not by a long chalk! 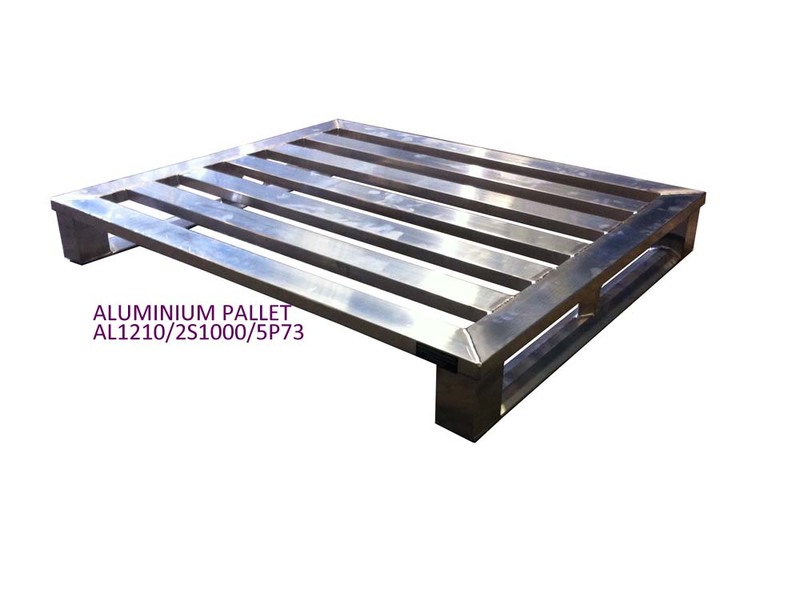 Aluminium Pallets – Light and easily cleaned, ideal for food and pharmaceutical. Stainless Steel Pallets – The Rolls Royce of pallets, hygienic, strong, durable and corrosion resistant. All of these can be manufactured to suit each customer’s individual needs. Plastic pallets are also offered but in this case, standard pallet sizes only can be offered. So, why choose something other than a timber pallet? Flat steel pallet, heavy duty, four way entry, with flat sheeted top. 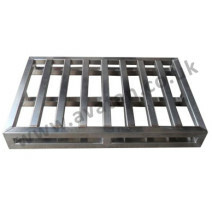 If your focus is not on hygiene, but instead on durability, then steel flat pallets are generally very economical. These again can be manufactured to suit customers needs, any size and to suit light or heavy loads. Avatan reflect on each customer’s requirements and will design pallets specifically to suit that need. Yes, there are common sizes and styles but adapting a standard pallet into something better suited to an individual’s needs, is a speciality we at Avatan pride ourselves on. Our range of flat pallets is extensive and ever increasing. With a standard painted finish, pallets will be durable but will be susceptible to chipping and subsequent potential corrosion. The addition of a hot-dipped galvanised finish will protect the steel. The pallet may then be suitable for some food processing environments. 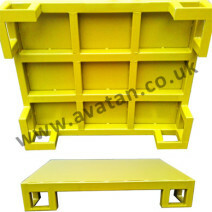 Also available from Avatan is a selection of plastic pallets. Again, there are many applications for these but sizes are generally restricted to standard pallet sizes. In this range, we have light duty single trip pallets all the way through to heavy duty rackable pallets. The answer to why choose something other than a timber pallets might be tempered by the industry sector you are in. Pharmaceutical companies often require stainless steel storage products taking full advantage of the corrosion resistance properties of this durable material. Aluminium pallets too are often used in this sector with aluminium playing an importance part in food processing and meat industries. The meat industry, e.g. butchers and abattoirs have many uses for these extremely light and highly durable hygienic pallets. Food processors in general need to keep wood out of production areas and aluminium and stainless steel win hands down when it comes to ease of cleaning. As to cost, aluminium pallets are relatively inexpensive. With ultra high corrosion resistant properties, pallets can be manufactured in 304 grade or 316 grade stainless steel. Both options are considerably pricier than all other materials but if your environment is particularly corrosive, then stainless steel pallets may be the only satisfactory option. In keeping with other pallets, materials used in the construction of stainless steel pallets can be adapted to suit light and heavy duty storage needs. Another article related to the comparison of flat pallets with some of their advantages and disadvantages is linked here. Whatever your needs, Avatan will try to help. Call 020 8429 4444 today. Avatan’s range of folding rod formed cage pallets is now being re-branded CubiCages. Our wide range of collapsible cage pallets will now be banded into one group within the CubiCage and Stackable Retention Unit pages on our website. We routinely carry stocks of a variety of CubiCages and now include within this range the Euro 91 folding Euro Cage Pallet. The family of folding cage stillages is becoming more popular as transport costs rise. With the ability to collapse the CubiCages into a fraction of their assembled size, transport and storage costs can be significantly reduced. For example, up to 480 Stackable Retention Units will fit in a 45′ load. Similarly approximately 280 Euro 91 cage pallets or similar number of rod formed CubiCages will fit in the same space. This compares with trailers accommodating only 40-60 of a similar but rigid container. Immense transport savings are possible. Our stock CubiCages are all manufactured to match the British pallet size 1200mm x 1000mm and, with an overall height of 1000mm, have a capacity of just over a cubic metre. The same volume will fit in our standard Stackable Retention Unit. Alternatively, the Euro 91 CubiCage Euro Cage Pallet is designed around the standard European pallet with nominal dimensions of 1200mm x 800mm x 970mm overall height. Holding large stocks of many of these items, Avatan Handling Equipment Ltd can respond quickly to customers needs. Next day delivery options are available to most areas within the UK. We are not suggesting that CubiCages are suitable for all eventualities and therefore offer an extensive range of more conventional stillages, cage pallets, box pallets and post pallets. Manufactured in our UK plant, rigid and collapsible stillages can be designed to suit your own very special needs. We take pride in the fact that we can be adaptable and welcome the opportunity to discuss customers storage problems. Let us help you solve your storage difficulties. Whatever your needs, sale or rental, do please give contact our sales team. We will be delighted to help. With stock build ups well under way for Christmas, have you enough stillages to meet the seasonal peak. Avatan Handling Equipment have stocks of Cage Pallets, Postracks and Hypacages, ready for immediate despatch. Our standard size 1200mm x 800mm x 970mm high Euro style cage pallets are always held in stock and are generally immediately available for sale or hire. Available as a rigid cage pallet, Avatan stock Euro 90 cage pallets with either corrugated steel decking, or alternatively with the more conventional Euro style timber base. Fitted with a half drop gate on one long side, the Euro 90 cage will store and retain loose products, safely and securely stacked up to 5 units high with 1000kg in each stillage. Also available in the Euro cage family are Euro 91 Collapsible Cage Pallets. Also readily available for sale and hire, these fold flat for empty storage, and serve to minimise return transport costs. Folded flat and re-assembled within moments the Euro 91 offers an extremely versatile storage medium. 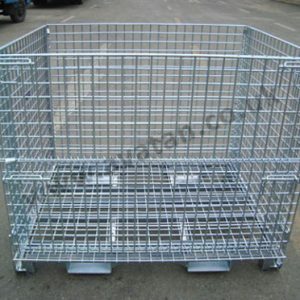 In our range of folding cage pallets, we also carry stocks of 1200mm x 1000mm x 1000mm Hypacages. With all four sides hinged to the base, these fold flat in a matter of seconds, to take up only a fraction of the space of the assembled units. Again, this facilitates the moment of between 250 and 300 empty and folded units in a standard trailer. With 500kg and 1000kg rated units all in stock, we also offer a heavy duty Hypacage with fork guides further improving the safety of this product while being handled by forklift. Although available readily in standard sizes, Hypacages and Euro Style cages may also be manufactured to order to suit your own specific requirements. Call us old fashioned, but we like to hear from customers. We can help you best if we understand your needs. Give us a call and let us know how we can help you. Down at the local authority recycling centres, it is always amazing to see the variety of materials being salvaged and their materials re-used. For bulk waste, cardboard, timber and garden waste, skips and large steel containers are routinely filled and ferried away. Meanwhile, greater emphasis is being placed on recycling electrical items including televisions and computer screens and these are often carefully loaded into steel stillages and then taken back to processing plants for dismantling recovering precious metals, plastic materials and glass. Avatan Handling Equipment produce such steel cage pallets and box pallets and will manufacture bespoke stillages in large or small quantities. As recycling centres are often short of storage space, particularly noted recently by recycling services in the Swansea valley, Avatan were asked to design stillages that would easily fit into smaller Recycling Centres. The steel pallets needed to be easily serviced by small vehicles. Clearly these needed to be of robust design with the sides well protected from projectile computer screens. The base of the pallet also had to be well braced and to further protect it, a separate easily replaceable sacrificial timber deck was laid over the sheet steel base, further lengthening the durability of the stillage. The resulting 3 cubic metre design was stackable and was fitted with fork guides enabling safe and secure forklifting from all four sides. With the success of the South Wales stillages, Avatan is hopeful that many more Recycling Centres will adapt this method of storing and transporting their electrical waste. If you have an unusual storage requirement, and need the problem to be considered with fresh minds, contact Avatan today. We would be glad to help.